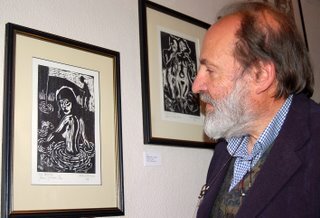 We have been to the Private View, at the Mount Street Gallery in Brecon, of an exhibition of the prints of Robert Macdonald, for many years an important figure in the artistic life in this part of the world . 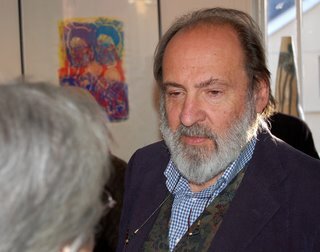 . . although he was originally from New Zealand. He came to Britain in 1958 and enrolled at the London Central School of Art where his tutors included such mouthwatering names as Keith Vaughan, Mervyn Peake and Cecil Collins! 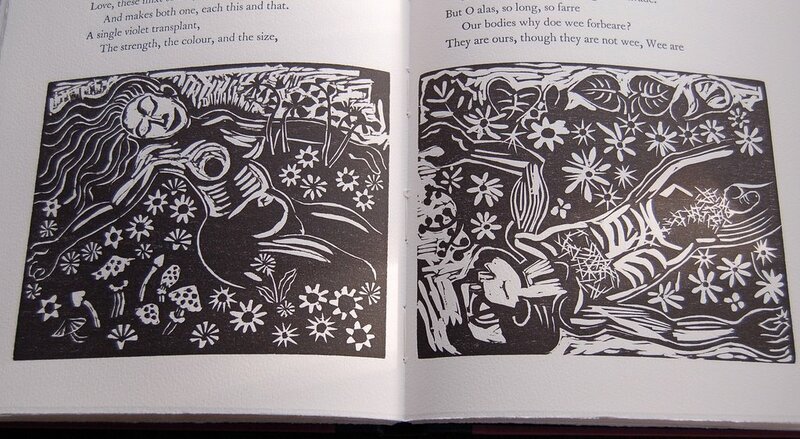 He has had considerable success with his printmaking but also with writing and with painting. 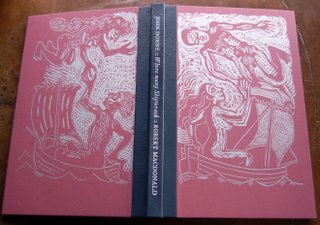 He is currently writing a book on Wales to be illustrated with his own drawings and prints. 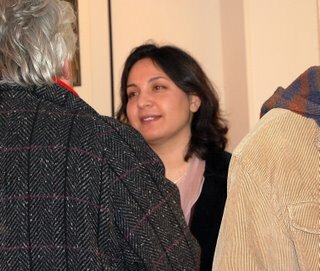 The Exhibition was ‘opened’ by Sameera Khan, the egregious and much lauded Studio Manager of the Swansea Print Workshop. Many artists known to us have been full of praise for her enthusiasm, knowledge and, above all perhaps, her willingness to tackle an artist’s problem by leaping in so that it can be solved together. 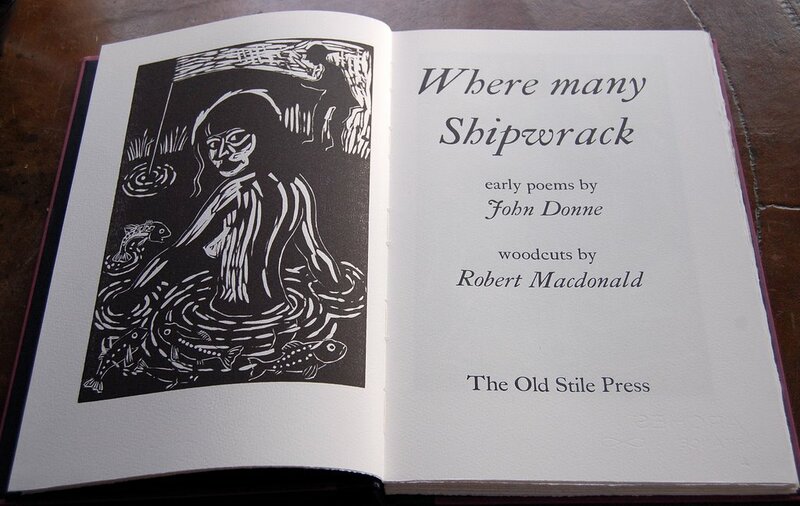 Here Robert stands beside a framed proof of one of the wood engravings he made for The Old Stile Press edition of the early poems of John Donne entitled Where Many Shipwrack. The book was published in 2004 but the numerous wood blocks were about four years a-cutting! 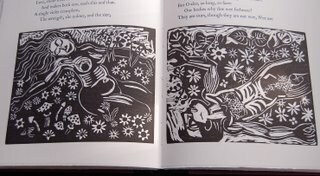 This intense and earthy love poetry seems to have found a perfect accompaniment in Robert’s strong, immediate and passionate woodcuts. The exhibition runs until 24th December, 2006 and full details of Where Many Shipwrack (including the Special Edition, of 26 copies, each of which includes a number of signed and numbered proof prints and an original watercolour painting) can be found by returning to our website.